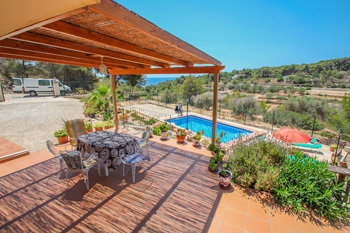 Dos Soles 6 is a well furnished villa enjoying beautiful views towards the sea and the Mediterranean landscape. It is located near the coast road between Moraira-Calpe, just 5 Min. drive from the La Fustera beach, where a variety of bars , restaurants and a supermarket can be explored. The entire coast of Costa Blanca has become a major attraction for its amenities and its unrivaled coastline. The villa offers parking for 4 cars, which leads down to a spacious sun filled terrace, offering a private swimming with sun beds, a cozy outdoor dining area with BBQ and a tennis table, making this space a perfect place for families or group of friends wanting to enjoy the holiday experience. Dos Soles 6 is a two storey holiday home, Dos Soles 6 is on the lower level, the top level will remind closed and empty during your stay. Entrance to the bottom floor we enter through living/dining room with Sat+TV+DVD followed by a fully equipped fitted kitchen and 2 twin and 1 double bedroom together with a shower room /WC and an extra WC. Dos Soles 6 perfectly encompasses both the Mediterranean touch , together with a peaceful atmosphere.